Texas Bluebird Society 2019 Bluebird Symposium Make your hotel reservation NOW! Join us Saturday, August 2 - 3, 2019 in Midlothian for fun, education, and friendship! Don't miss the Friday Evening Social. Photos from the 2018 Kickoff and 2018 Friday Night Social. When you're shopping with Amazon, please use our Amazon Smile account by clicking on the image or the link smile.amazon.com. Doing so will result in an Amazon donation to the Society. "Please Do Not Disturb" Educational Sign for Nestboxes Now Available!!! "Please do not disturb" educational signs for nestboxes now available from Johnson City Sign Shop, either 1 sign or in groups of four. Many thanks to Rick for creating "our sign", envisioned by TBS member Paul Nelson. We promote bluebirds by serving as knowledgeable presenters and by organizing bluebird booths at various events across the state throughout the year. Check the Events tab for a list of our past and future activities at venues throughout the state. 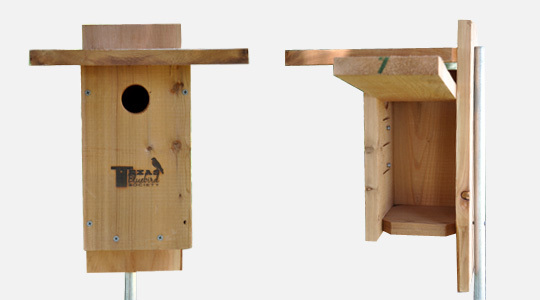 At the heart of TBS efforts is the construction, distribution, and sale of a "well-suited for Texas" bluebird nestbox* known as the "Texas Nestbox." We have built over 16,000 nestboxes since 2002. This is quite an accomplishment. Think of the difference TBS is making in preserving, studying, and promoting these beautiful birds. Come, learn and work and enjoy with us. Join us in our efforts to promote "Bluebirds across Texas . . . one nestbox at a time!". * a "nestbox" may be called "birdhouse" or "nesting box." When you shop with AmazonSmile.com, a portion of the proceeds go to the Texas Bluebird Society. Visit AmazonSmile for more details. W P Bluebird Festival	Saturday, April 20, 2019 (9:00 am - ?) Note: Texas Bluebird Society will not be participating this year due to the Easter weekend. See you in 2020. 2019 Bluebird Symposium August 2-3, 2019 - Make your hotel reservation NOW! Snakes, English sparrows, 4-legged Critters? Check out our Nestbox Recommendations for information on the Universal Sparrow Trap and Kingston Stove Pipe Baffle. Our ingenious and resourceful members have devised many ways to thwart predators including adding a "tutu-like" skirt to entangle snakes. Click on the "Nestbox Recommendations" tab on the Resources page. We provide a link you can use to order the trap directly and a link to building plans for the baffle. 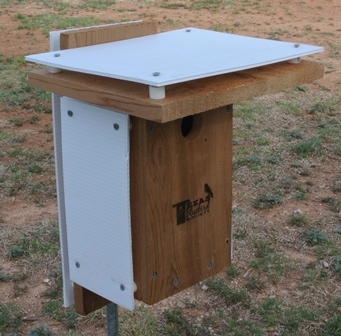 The "Texas nestbox" we sell is customized for the Universal Sparrow Trap (with screws under the hole). We also sell baffle kits at our Summer Symposium and Kickoff Seminar. Texas Bluebird Society recommends the addition of white or light-colored paint and/or a set of HeatShields, to weathered nestboxes, unless they are shaded from late afternoon sun. 2011 heat studies conclusively revealed that as a nestboxes darkens with age, the interior temperatures jump dramatically. Discarded political signs with a white back side can be recycled as HeatShields. With a pen knife, trim rectangles identical in size to the top, sides, and back of the weathered nestbox. Affix to nestbox with screws using tubing to create one-half inch (approximately) of air space. You can see plans for the HeatShield under the Nestbox Recommendations. You can also buy pre-made heatshields at our Summer Symposium and Kickoff Seminar. Click on the "Nestbox Recommendations" tab on the Resources page. Note: There may be a few general search results prior to any TBS Specific search results. The TBS search results will be preceeded by a thick horizontal bar. 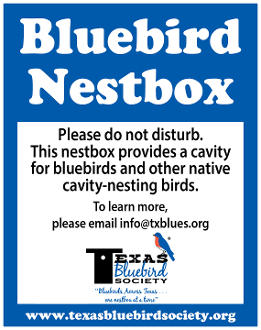 To spread "Bluebirds (and other native cavity-nesting birds) Across Texas ... one nestbox at a time" - through education; and, the installation of "NestWatch'd" nestboxes in appropriate habitat; and, sustaining and increasing their natural food supply (insects and berries of native plants) - while enjoying the process and the bluebirds. of your donations go to buying lumber for our volunteers to build nestboxes! Donate now. NABS offers "A-Plus" $15 New Membership to TBS Members.